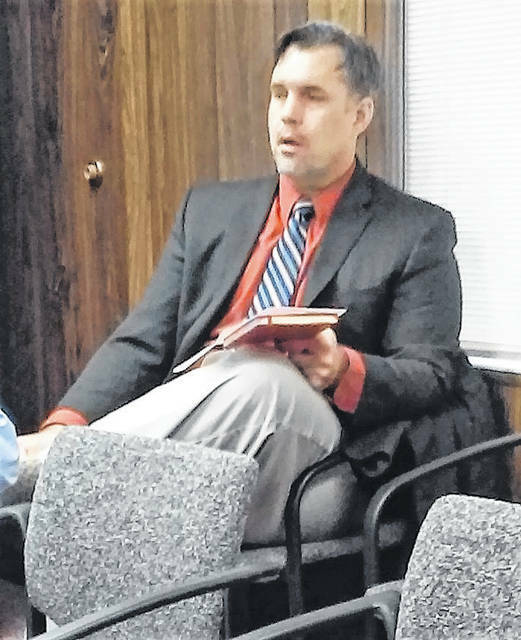 Greenfield City Manager Todd Wilkin told Highland County commissioners Wednesday that Greenfield had been awarded a $500,000 grant for infrastructure improvements. Highland County commissioners gave final approval Wednesday in a resolution authorizing the board of elections to proceed with acquiring and deploying new voting machines for the upcoming May primary election and beyond. Commissioner Terry Britton said the board of elections selected the proposal from Clear Ballot of Boston, Mass. for the equipment, adding that everything will be paid for by the state. As previously reported in The Times-Gazette, the state would contribute $572,000 for the upgrade for whatever system the election board selects. Of the three proposals that were under consideration, the board of elections selected Clear Ballot’s “hybrid” system, which Administrator Steve Witham described as using the familiar touch screen, but would also print out a paper ballot that the voter physically would take to an optical scanner at the polling place. The Clear Ballot system gives the board of elections the flexibility to upgrade its high speed scanner and ballot on-demand printer, he said. The state board of elections had given all 88 Ohio counties until the Nov. 5 general election to complete their upgrades, but Witham said he wanted everything in place prior to the primary election on May 5. In other matters, Britton said that the month of January was “especially rough” for Highland County Children Services. He said he spoke with JFS Director Katie Adams, who told commissioners she would keep them up to date on the situation. Greenfield City Manager Todd Wilkin informed commissioners that the village had been awarded a grant totaling $500,000 for critical infrastructure improvements, particularly in remedying storm sewer issues on Fifth Street near the Greenfield Area Christian Center. Also Wednesday, commissioners approved two other resolutions and one contract. Of the two resolutions, one was a line item budget transfer for the Highland County Sheriff’s Office and the other confirmed the appointment of Danielle Rask to the Highland County Law Library Resources Board. The lone contract that commissioners signed was with the Ohio Department of Transportation for continued operation and maintenance of a global positioning system reference station that was installed on a building previously owned by ODOT, but is now owned by Highland County. Commissioners went into recess at the conclusion of county business and then reconvened for a policy and procedures meeting with the Ohio Valley Regional Development Commission.